Hi! Man, I've just stumbled upon your blog and I'm hooked up to it in just a few minutes of reading! Anyways, me and my dad are looking for the best way to invest and so far of what I've read, MFs and UITFs are the best way to go with regards to returns and risks. I'm really new to investing and have no knowledge whatsoever regarding finance (Programmer/Call center agent here). What I want is to diversify our investments in the sense that we will have long-term, low-risk investments that will not be touched but also have high-risk, short-term investments that will allow us to get income on a monthly or a quarterly basis. Personally, I'm thinking UITFs, Retail Treasury Bonds and stocks. 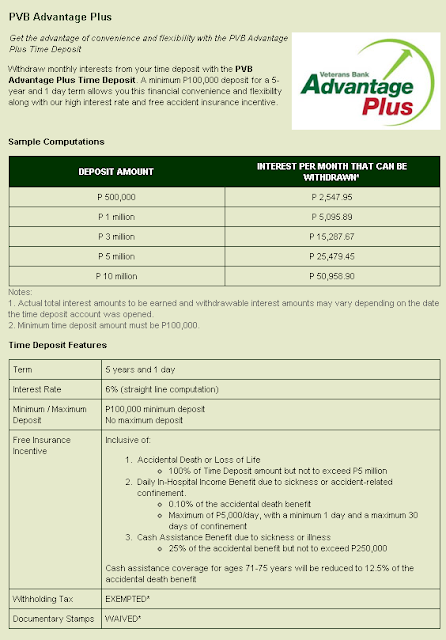 Though I'm also curious about the Equity Fund :D My dad is thinking of time deposit (Veterans has this promo where they also include health insurance, 1m will net about 5k a month according to their website) but we'll need to invest about 2m to get at least 10k a month for our needs (not even half of what we spend in a month). Though we can afford that investment, I personally don't want to put all our eggs in one basket. what do you think? thanks in advance! From what you're saying, you and your dad want to invest together and share one portfolio, am I right? That explains your mixed investment goal of achieving high growth, which is typically associated with younger investors like you, and periodic income, presumably for your dad's or the entire family's spending needs. So given your situation and needs, here's what I propose. An equity fund, on its own, should be able to address your need for both growth and income: it has the best potential for high long-term returns among all commonly available investments, and its liquidity gives you access to income by redeeming units whenever you need or want to. In terms of risk, I still say it's better than picking individual stocks because you'll be investing in companies from different industries, although there's always a chance that unit prices will go down considerably with a shock or event that can affect the entire market, at any point in the future. This is something I learned from Mark Cuban recently. Not only can you use an ample cash balance as a reliable cushion in times of financial emergencies, you can also use it to take advantage of attractive investment opportunities that become available from time to time, like when bubbles burst and everyone panics and pushes stock prices to unjustifiable lows. This is what your dad is considering. 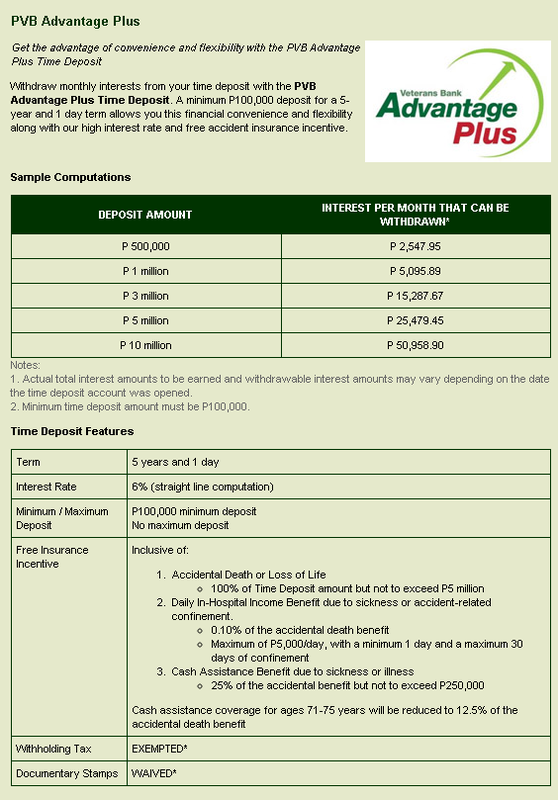 It is is a tax-exempt, 5-year time deposit that bears an interest rate of around 6% per year (or around 7% if you count the accompanying life/accident/health insurance, which I roughly value at 6,000 pesos per year). It's the same flavor of investment those rural banks became infamous for, but the interest rate is considerably lower and closer to prevailing market rates. And partly because of this, I believe there's very little chance that PVB will fail. Still, just to play it safe, you might want to limit your exposure to 500,000 pesos, which is the maximum covered by PDIC. What sets this apart from other similar long-term time deposits is that it gives you access to your earnings even before the investment matures, a feature that partially answers your need for periodic income while providing modest returns and capital preservation at the same time. So that's it, a mix of equities, cash, and long-term time deposit for your mixed investment objectives. Feel free to play around with the actual proportions as these are just based on rules of thumb. "Happy Valentine's Day" = "Ad Hype Spent Vainly"